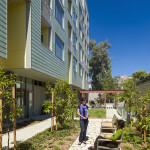 Sustainability and high design meet in Leddy Maytum Stacy Architects’ affordable housing complex. 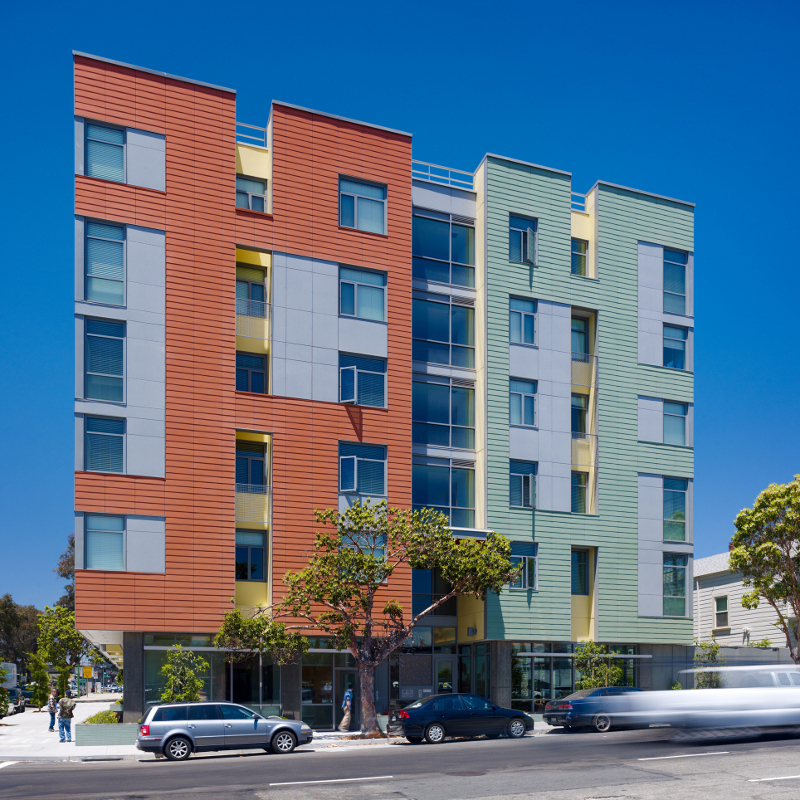 Designing a sustainable building on a budget is tricky enough. 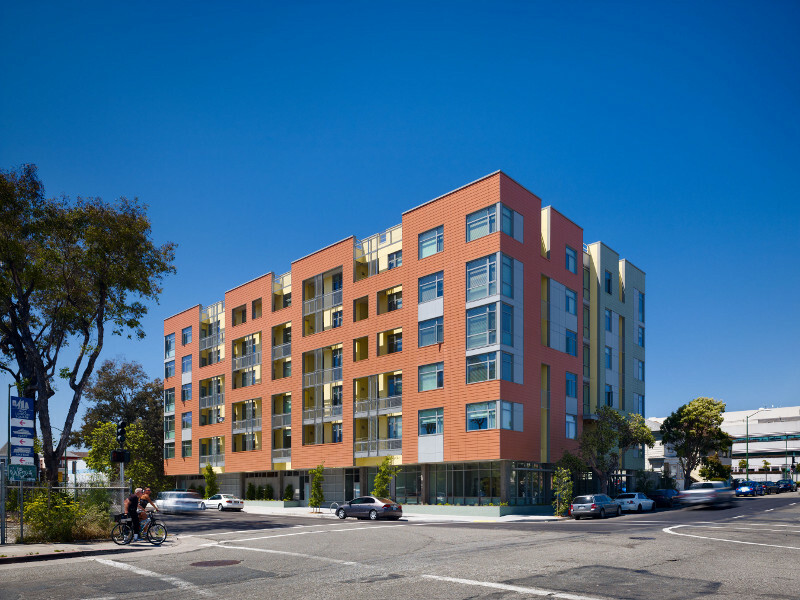 But for the Merritt Crossing senior housing complex in Oakland, California, non-profit developer Satellite Affordable Housing Associates upped the ante, asking Leddy Maytum Stacy Architects to follow not one but two green-building ratings systems. “They wanted to push the envelope of what they typically do and decided to pursue not only the LEED rating, but also the GreenPoint system,” said principal Richard Stacy. 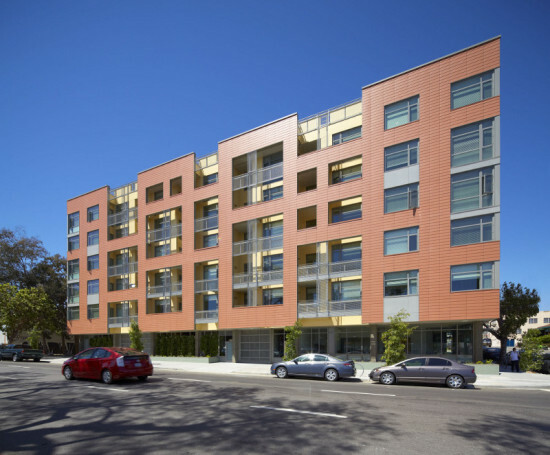 “So we actually did both, which is kind of crazy.” Wrapped in a colorful cement-composite rain screen system punctuated by high performance windows, Merritt Crossing achieved LEED for Homes Mid-Rise Pilot Program Platinum and earned 206 points on the Build-It-Green GreenPoint scale. 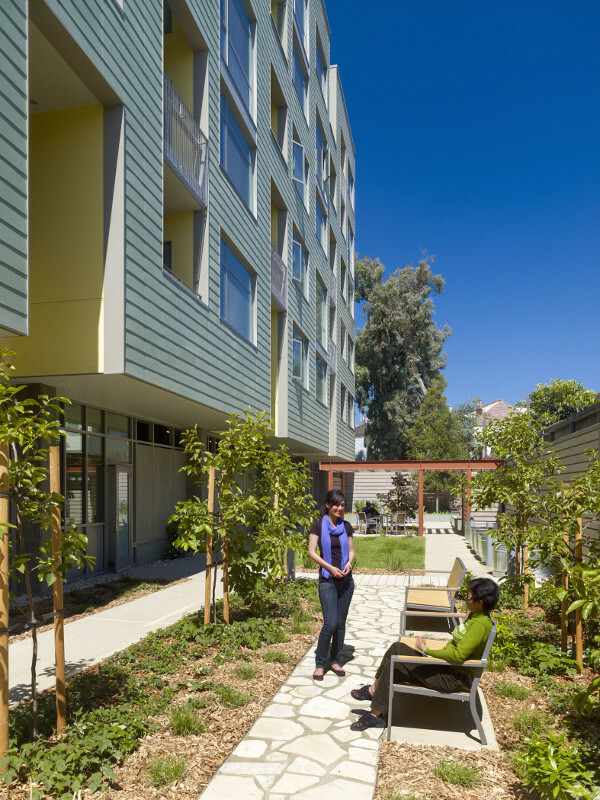 The building was also the first Energy Star Rated multi-family residence in California, and was awarded 104 points by Bay-Friendly Landscaping. 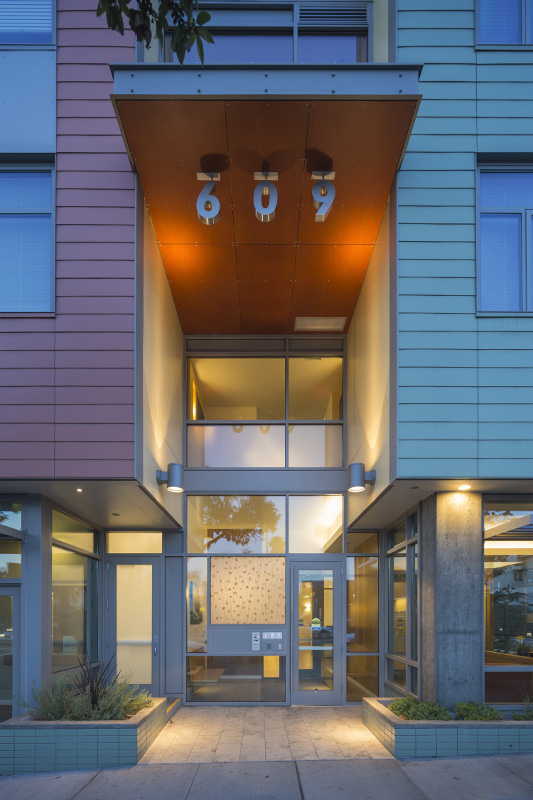 Finding themselves with unused contingency funds during construction Leddy Maytum Stacy Architects upgraded the exterior skin to a rain screen system of SWISSPEARL cement composite. “We worked pretty closely with the SWISSPEARL company,” said Stacy, who noted that Merritt Crossing may be the first building in the United States to use the system. Though the panels are installed like lap siding they offer “the benefits of a rain screen in terms of cooling and waterproofing issues,” he explained. To accommodate the thicker skin, window manufacturer Torrance Aluminum designed custom trim pieces, which “had the added benefit of giving us the appearance of deeply recessed windows,” said Stacy. Insulation was a special concern for the architects, both because Merritt Crossing was built using metal frame construction, and to minimize air infiltration in keeping with the green ratings systems. 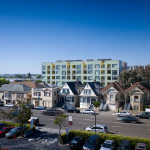 The building’s exterior walls are wrapped in 1-inch-thick high performance polyiso insulation from Dow Corning with a Grace Perm-A-Barrier VPS vapor permeable membrane. “As a result we ended up with a very, very tight building from an air insulation standpoint, which means you have to pay more attention to air ventilation,” said Stacy. 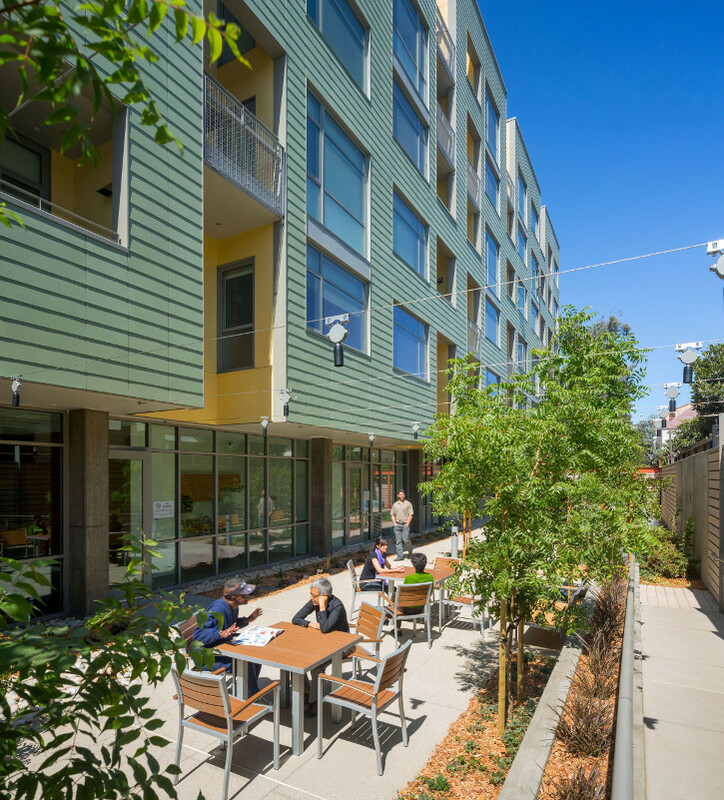 To compensate, Leddy Maytum Stacy Architects’ mechanical engineers designed a special air filtration system for the building’s roof, complete with built-in HEPA filters. 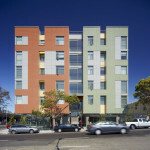 The building’s southwest facade faces a freeway, presenting potential noise and privacy issues in addition to exposure to the western sun. “We did a highly layered facade on that [side] where the actual exterior wall is back three to four feet from another screen wall,” said Stacy. The outer wall “is a combination of typical wall assembly as well as GreenScreen panels that form a webbing of open areas and solid areas that help with sunshading as well as acoustical [dampening] and privacy.” Greenery in balcony planters will eventually grow up and over the screens. On the ground floor, the garage is also enclosed in GreenScreen trellising, to enhance pedestrians’ view without sacrificing ventilation. 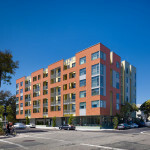 Leddy Maytum Stacy Architects’ Merritt Crossing proves that affordable housing does not have to look institutional. 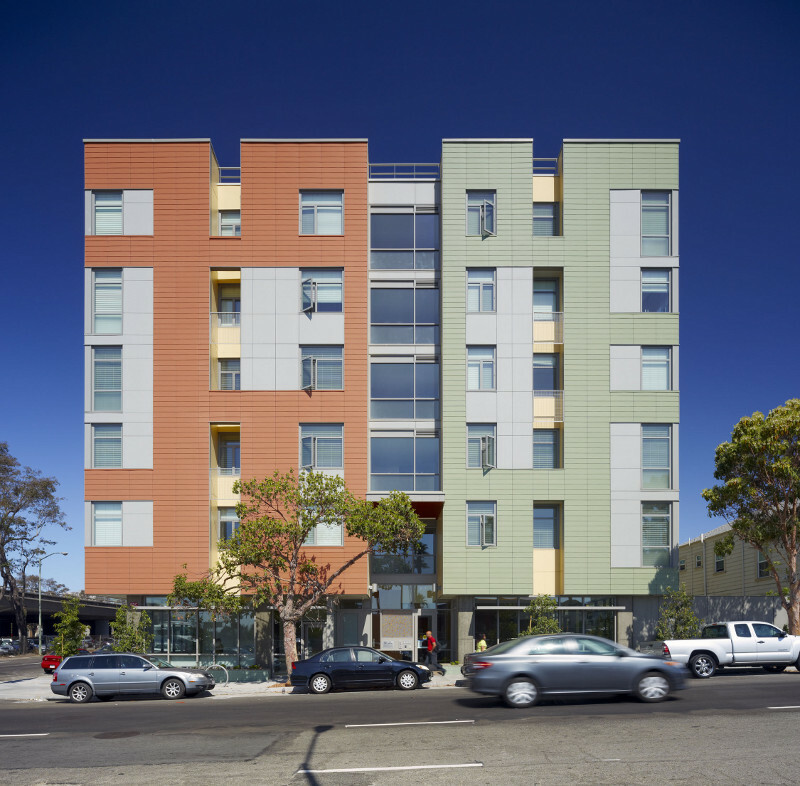 The facade’s vibrant colors—green on the northeast elevation, red on the southwest—and playful punched texture pay homage to the neighborhood’s patchwork of architectural styles and building uses. 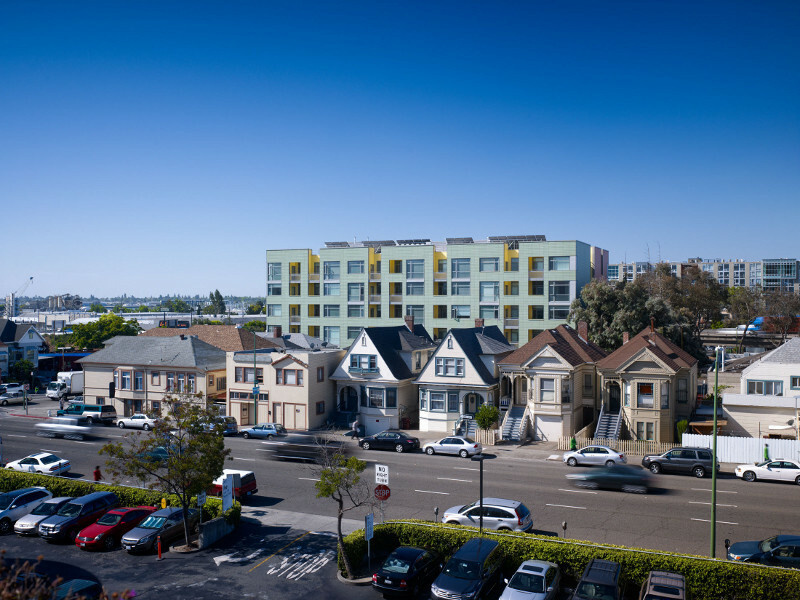 The first major building in the planned redevelopment of the area around the Lake Merritt BART regional transit station, Merritt Crossing sets the bar high for future developments.